This class will teach you how to graft your own apple tree to take home as well as how to care for your trees from planting till harvest. 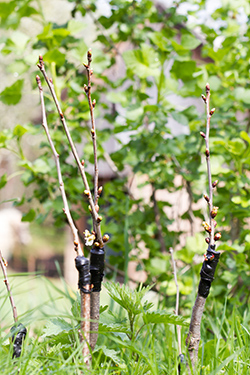 Topics will include rootstock selection, pruning basics and creating habitat that will insure pollination of your new ‘orchard’. The course will provide semi-dwarf rootstocks, a selection of heirloom apple varieties to choose from as well the materials to make your own grafts. This is a hands-on class for all skill levels. Instructor: Dan Bussey grew up in the middle of his family’s farm orchard in Wisconsin and has been surrounded by apples all his life. Dan is a past president of the Wisconsin Apple Grower’s Association and had operated Albion Prairie Cyder Orchard and Mill in Edgerton for over 30 years before coming to work as the Orchard Manager at the Seed Savers Exchange from 2012 until 2017. Dan has taught fruit tree grafting for 32 years and lectures on heirloom apple growing, orchard management, cider making and even apple pie baking. Dan is the author of the recently published, 7-volume “The Illustrated History of Apples in the United States and Canada” by the Jakkaw Press of Mt. Horeb, Wisconsin. This book won the 2018 Literature Award given by the Council on Botanical and Horticultural Libraries. Dan currently resides in Ridgeway, Iowa. $50/person - Includes materials fee.